Video clip synopsis – Written on board the Endeavour during his trip down under in 1770, James Cook’s journal records the beginning of Australia as we know it today. Broadband MP4 endeavou_bb.mp4 (17.4MB), suitable for iPods and computer downloads. Endeavour Journal is an episode of the series National Treasures produced in 2004. What is Australia’s greatest book? In the National Library of Australia there is a 743-page volume that could lay claim to the title. 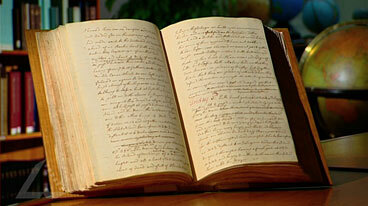 It is Lieutenant James Cook’s journal, written on board the Endeavour during his trip down under in 1770. Warren Brown leafs through these precious pages to discover Cook’s first impressions and trace the beginning of Australia as we know it today. Captain James Cook FRS RN (October 27, 1728 – February 14, 1779) was an English explorer, navigator and cartographer. Cook made three voyages to the Pacific Ocean. James Cook was the first European explorer to chart the east coast of Australia. Written on board the Endeavour during his 1770 trip, James Cook’s journal records his first impressions and traces the beginning of Australia as we know it today. Warren Brown asks: what is Australia’s greatest book? In his answer, does Brown’s language leave any room to doubt his conclusion? Explain. What widespread misconception about the naming of Cook is dealt with early in the clip? Why is this misconception so widespread? In the segment where Brown reveals Cook’s journal in the National Library, what is Brown’s reaction to the book? How is this displayed through language features, gestures, facial expressions and vocal features? Brown reads an extract from the journal about the ‘discovery’ of Stingray Bay and its subsequent re-naming. What assumptions are made in this section of the clip and what gaps and silences are evident? According to Brown, why is the journal a national treasure? Warren Brown enthuses about the status of Cook’s journal as a national treasure, but what is missing from Brown’s account? For example, what might an Indigenous Australian make of this clip? The story of Cook’s voyages up the east coast of Australia is fraught with controversy. Through research, discover how Cook is represented by different people from different backgrounds (e.g. different schools of history, indigenous people including Australian Aborigines etc). Research one of these groups and research Cook’s travels. From their perspective, decide: was he a hero or a villain? Prepare to participate in a panel discussion where a range of views on Cook can be discussed and debated. In your role, justify your conclusion by reference to the criteria you develop to apply to him in your role. Alternatively, debate whether Cook’s Endeavour Journal really is Australia’s greatest book.